I have a wife and four children (Ages 15, 13, 12, 11). We were invited to stay at Coco Key Water Resort in Orlando, Florida. Here is an overall review of our experience. From the point we checked in, to the moment we checked out, every staff member smiled, greeted us, and asked if we needed anything. It seemed the staff really loved working for Coco Key and took pride in their job. This included the lifeguards at the slides who smiled at every single guest and made sure the children were able to enjoy a safe, fun environment. We stayed in the Junior Suite, located in the Tower Building. The room had a king size bed, two foldout couches, two flat screen TV’s, dining area, college fridge, and plenty of drawers to store our clothes. The room was clean, comfortable, and perfect for our family of six. 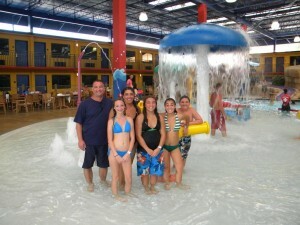 Whether you are an adult, teenager, or small child, there is something for you at the Water Park. ~ Indoor area with poolside Tiki Hut for adults. ~ Pool Cove for teens with a twisting water slide. ~ Lagoon for younger children that included four small slides, water cannons, mushroom waterfalls, and several different types of pipes that can be moved to splash someone you know. ~ Booming music that keeps the guests entertained and dancing in the pool! ~ 6,500 foot arcade room. Two of the slides have enough sinking turns to get you laughing and screaming as if you were on a roller coaster. The third is a boomerang slide made for two guests to ride at the same time, with a first drop that is straight down, followed by a vertical rise that feels like you are going to fly off the edge, then sending you backwards through a waterfall splash, big dip, ending in a pool of waves. The average wait time for the slides was less than five minutes. ~ Play island for everyone, which includes water slides, jungle gym, water cannons, and a 400-gallon bucket that dumps on the entire area every five minutes. ~ 1,000 foot fitness room with several different kinds of treadmills and free weights. ~ Massive lobby with a business center, small movie theater for children, adult area to watch sports, an information/planning booth for Universal Studios, and plenty of space to sit and relax. ~ Heated pool area with hot tub, Tiki Hut, and more than enough places to sit, even with our large family. ~ Free shuttle service to Universal Orlando, Sea World, Wet-n-Wild, and Aquatica. ~ After a tough day of water park slides, swimming, and roller coasters, you can unwind with a relaxing massage. ~ Two dining areas and an onsite Pizza Hut!! !